MariaDB vs mySQL. EasyEngine: lickety-split installation of WordPress on a LEMP stack, with selective SSL. UPDATE June 25th, 2014: Screw this entire post. The guys at rtCamp (see comments) found this post and turned me on to their wonderful EasyEngine (@easyengine), which installs the entire LEMP stack and WordPress almost completely hands-free. It also looks like a more secure installation than what I’ve advised. So go with EasyEngine, and forget the below. You won’t be sorry. UPDATE June 27th, 2014: I’ve published this post, which supplants the below. It details the EasyEngine way of setting up the LEMP WordPress stack, along with selective SSL. Go there instead. As I’ve said in a previous post, I’ve recently migrated this blog from a hosting provider to the AWS EC2 cloud. On a free-tier micro instance, I was able to install the software I wanted, configure everything as I liked, and it still runs faster than my old provider. However, installing the stack to get it the way I wanted took some time, because there was no one blog post anywhere that covered what I was trying to do. I had to synthesize instructions for installing LEMP, installing WordPress over Nginx, and installing SSL with Nginx/WordPress. Some of it was trial and error, too. OS: Ubuntu 14.04 LTS Server, which is the latest and greatest Ubuntu. Webserver: Nginx (pronounced “Engine-Ex”), since it runs so much faster than Apache. Database: MariaDB, instead of mySQL, for reasons I’ve given in my previous post. Blogging software: WordPress: since that’s what my existing site was using. SSL: for all requests for the login page and the wp-admin interface, SSL should be forced. For all other pages, plain HTTP should be forced. Note that I’ll cover both creation of a new site (section III A), and migration of an existing site (section III B). If anyone really needs help with any the above, please leave a comment and I’ll consider adding it. This section is mostly lifted from Digital Ocean’s post, as well as kengggg’s gist which covers MariaDB. Log in to your machine (either from the console or through ssh). NOTE: Do set a root user password. Answer “No” to “Change the root password?”, since you’ve already set it above. Answer “Yes” to each of the remaining questions. To test that Nginx is working, just point a browser to http://<your server’s IP address>. You should see the “Welcome to nginx!” page. This change fixes a security risk by disabling it. If cgi.fix_pathinfo=1, then PHP will try to resolve URLs that it can’t find by returning a file that is as near to that URL as possible. By setting it explicitly to 0, requests for incorrect URLs just fail with a 404 error. NOTE: The “listen” line may already be correctly set to /var/run/php5-fpm.sock in your version of www.conf. NOTE that some lines, like “fastcgi_pass 127.0.0.1:9000;” stay commented out (or you can delete them, of course). create the file “info.php” in your root directory (usually /usr/share/nginx/html, but if you’re using an older version of Ubuntu, it might be /usr/share/nginx/www). Now that you’re sure that PHP is working, DELETE info.php. You don’t want to advertise to a potential hacker what your server’s settings are. This section assumes that you are installing WordPress from scratch, not migrating an existing site. If you want to migrate an existing site, go to section B.
Configure WordPress to work with the new database. Move the entire “location / ” block to after the entire “location ~ \.php$” block. Save file and exit text editor. From a browser, go to your site (http://<yoursitename.com or IP Address>). The WordPress installation screen should appear. Complete it and submit it. Congratulations, your site is up! Go to section IV. If you’ve done a fresh install of WordPress (III A above), skip section B and go to section IV. Note that the following commands are to be performed on the old server that you are migrating from. This section assumes that the old site is also hosted on a Linux machine, with mySQL (or MariaDB). Adjust accordingly if the old server is a Windows server, or if the old server’s database is something other than mySQL or MariaDB. The above command will prompt you for wordpressuser‘s password, and dump the schema and data of wordpressdb into the wordpressdb.sql file. If the old site has SSL, locate the old site’s SSL certificate (.crt) and key (.key) files. You can probably find them in the web server’s configuration files. Copy the zipped db dump (wordpressdb.tar.gz), zipped WordPress site (oldsitefiles.tar.gz), and the .crt and .key files to the new site. I’ll leave the dear reader to figure out how to do that, whether with SCP or FTP or some other file transfer protocol if that’s what’s available. The following commands are to be performed on the new server that you are migrating to. This assumes that you’ve gotten the files above over from the old server to the new server, and that the files are sitting in your account’s root directory (~/). If at the top of the file, there are any CREATE DATABASE or USE statements, delete those lines. Configure WordPress to work with the imported database. From a browser, go to your site (http://<yoursitename.com or IP Address>). Congratulations! Your old site should be up and running on your new server. As a reminder, our goal here is to force SSL on login pages and wp-admin pages. Fortunately, Pothi Kalimuthu was generous enough to post his configuration files to Github, which cover the same issues almost completely. I’ve borrowed heavily from these, especially admin-over-ssl.conf. Also, this section assumes that you’ve either migrated your SSL certificate from your old site, or you’ve already purchased, requested, and downloaded a new certificate from a trusted certificate authority (CA). Your CA probably has good instructions on its web site for obtaining an SSL certificate. This code above redirects any requests for URLs that contain “wp-admin” or “wp-login” to HTTPS (i.e. SSL). Make sure that you remember to change the instances of “yoursitename.com” to your actual site’s domain name or IP address (see the helpful comments in the virtual host code above). Navigate to http://<yoursitename.com>/wp-admin. Make sure that you’re directed to https://<yoursitename.com>/wp-admin, and that the login page is also https. Again, please let me know in the comments if there are any inaccuracies, inefficiencies, or if anything is just plain unclear in the above. I hope that this guide saves some people some time. 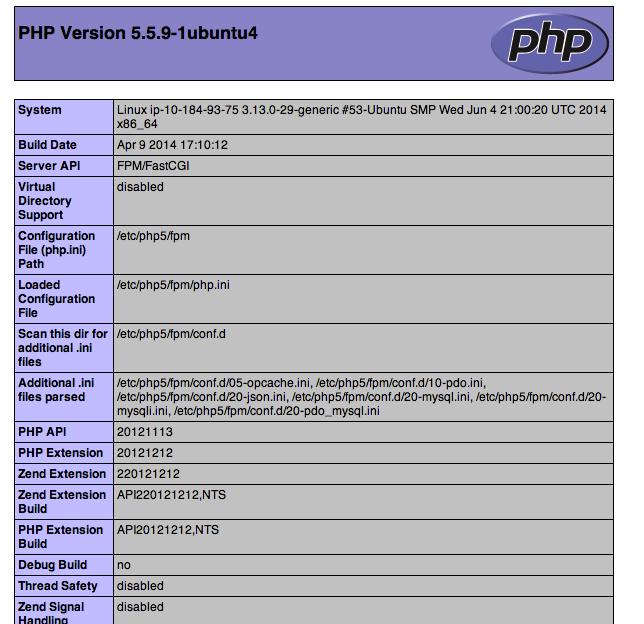 8 Responses to Installing LEMP (Linux, Nginx, MariaDB, PHP) for WordPress, with selective SSL. You will surely like EasyEngine. It’s really easy to setup and works at a fastening speed. Avadhoot, this is truly amazing. In a future post, I’m going to recommend this over my instructions here (or at least limit them to SSL setup). Fantastic! Really glad that you liked it 🙂 Do let us know (@easyengine on Twitter) when you cover EasyEngine in future. Also we decide to switch to the percona mysql 5.6 in future. I’ve setup and configured my LEMP on EC2 Instance by following this tutorial (although I’m using RHEL as instance it should be OK and I’m able to setup the webserver successfully eg. all services active). The only thing is I can’t access the server via web browser neither IP address nor the server public DNS. Any step I missed? Or should change permission for some directories of files? Well, why don’t you just use EasyEngine? Also check your AWS security group settings.